Looking to embellish your outdoor garden without garnishing your water bill? 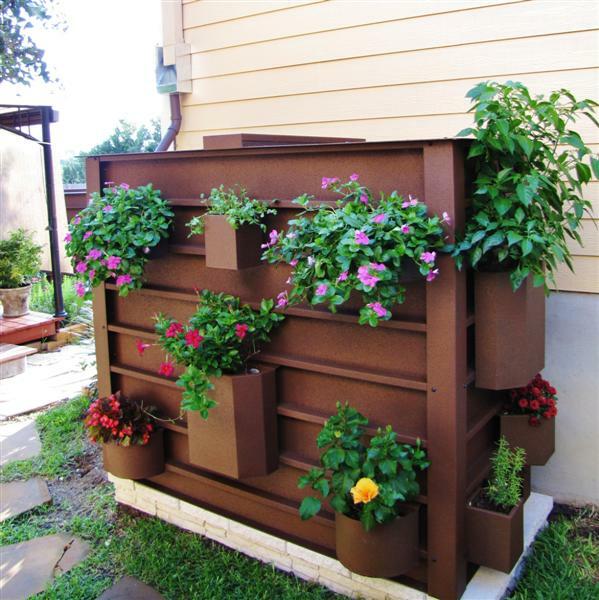 Here’s a green idea for that green thumb, and the latest craze in home rainwater collection: Austin’s own Living Rainwater Tanks. Whether you own a house in Circle C or a condo in Central Austin, rainwater catchment can save you money while conserving a precious natural resource. Each Living Rainwater Tank holds the equivalent of six to ten standard rain collection barrels and is manufactured right here in Austin. But what sets them apart is each tank simultaneously serves as a vertical gardening surface. “These one-of-a-kind tanks are not only functional, but aesthetically pleasing,” explains creator Paul Irvin. Living Rainwater Tanks come with beautiful, detachable planter boxes for herbs, vegetables, succulents, and other plants. They were specifically designed with the needs of urban communities like Austin in mind. “Their compact design and piece-by-piece assembly allow homeowners with smaller yards to easily assemble their tank wherever they like,” adds Irwin. Owners can choose from five colors, making it easy to match their home. Even the coating on the tanks is eco-friendly! Each Living Rainwater Tank uses the equivalent of one car tire in recycled rubber. Speaking of tires, this young company is already attracting star attention: Leilani Munter, Discovery Channel’s #1 Eco Athlete and one of the top female racecar drivers in the world, had her Living Rainwater Tank installed this past summer. Are you up for the challenge? Check out the eye-catching options at www.livingrainwatertanks.com. Austin realtor Brian Talley supports local businesses and appreciates innovation that supports water conservation. If you’re on the lookout for an garden-friendly Austin home for sale , check out Brian’s Austin Home Search!